30 years ago we traveled everywhere and made friends with all sorts of people. Today one has to be a bit more circumspect. Their are pirates, thugs and radicals in many parts of the world and many do not like particular foreigners. It used to be that if you wore a Canadian flag you were safe, but no one is safe in some areas today. Having said that, many travellers still trek to Nepal, Iraq, Egypt, Kenya and all over, meeting wonderful people and feeling completely safe. Still in the current situation with terrorist and radicals and so many issues in many places, it is wise to be careful and choose your holidays with care. 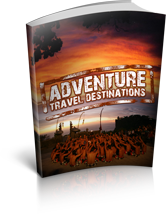 As an Adventure Traveller you will probly explore some out of the way places. You might end up in Egypt as the time of the riots, Africa in a coup, Afghanistan in the war. Who knows what is going to happen next. If you are travelling alone, be well informed about where you are going. Checkout your destination on the trouble watch list before you plan a trip and before you go. The U.S Department of State issues travel warning on most hot spots at http://travel.state.gov/travel/cis_pa_tw/tw/tw_1764.html. Always check laws and customs of the country you are travelling to. A simple hand gesture might be an insult. In Malaysia it is an insult to step on a coin with the head of state on it. Patting a child on the head can be considered offensive in some places. In many countries, especially in the Middle East, shaking hands and eating must be done with the right hand only. In many Muslim countries, it is illegal to eat in public during the holy month of Ramadan. Be aware of what goods you can take in and out of a country. For example, It is illegal to carry a likeness of the Buddha out of Thailand. Knowing laws and custom can help you not offend or get put in jail. In some countries their are swift death sentences for carrying drugs and severe treatment crimes against the state or religion. If you are going to a doggy place, be sure to leave copies of your passport and important documents with someone. Register your whereabouts to your embassy on arrival or with your home embassy if you are staying a few weeks or more in a dangerous area. It is best to keep your important travel documents with you and not in your luggage. Don’t put personal documents and names and address on and in luggage. This can lead someone to your home. Not a good plan! If you are in an area know to be hostile to foreingners and particular groups, dress conservatively and try to blend in. Avoid clothing or other items that openly label you. Be aware of what is going on around you. Be careful when talking about your traveling plans with strangers. Don’t wear flash jewelry, someone may stalk you. Act like busy travelers at the airport with business a purpose, things to do and somewhere to go. Use official taxis and other transportation services at official pickup points. Keep in open areas and avoid narrow alleys or poorly lit streets. Its a good idea to have a dummy wallet and keep your money separately. Wrap your wallet in a thick rubber band, it will make it difficult to remove from a pocket. Carry your purse under your arm. Don’t carry a pile of cash around with you and don’t display your cash. leave your money in the hotel’s safe. Don’t carry your passport with you unless you might need it or it is required.